Muttluks Dog Boots Review – Which Dog Boots Are Best? 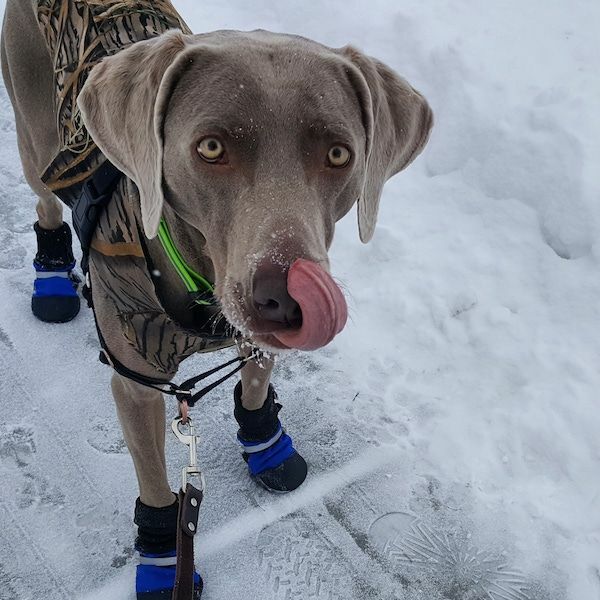 I ordered my Weimaraner Remy a pair of original fleece lined Muttluks dog boots. This is not a sponsored post. I just wanted to share my review with you before winter is long forgotten! 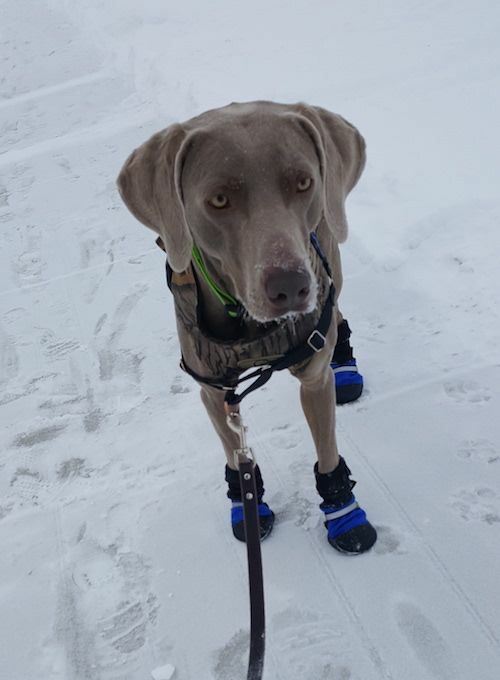 Remy doesn’t need to wear dog boots most of the time, but I wanted some for those weeks when it gets below 0. We had a colder than normal winter for Montana, so I’m really glad I bought these boots! Sure, we can skip a walk for a day or two but this is not a great option for multiple days in a row. My dog and I are very active; we like to get out and run! So … dog boots it is! After using these dog boots through a brutally cold February, I will say I’m very happy with them for our leashed walks and runs. They meet all the requirements above, and I’ve already recommended them to a friend. I love the quality, warmth, durability and that they’re lightweight. The Muttluks do take time to learn how to put on and you definitely need to get the right size (measure!) or they will look like flippers and fly right off! More details on sizing below. They need to go on TIGHT. I’m happy with the quality of the Muttluks dog boots. My dog has thick, strong nails, but the Muttluks have held up great so far. We’ve been running on pavement, concrete, snow and ice. How durable are the Muttluks dog boots? We used the Muttluks for one season, so there were maybe 15 days total where my dog needed them. Just guessing, he probably walked/ran about 15 miles in the boots. It may be a little early to judge their true durability but I’m happy so far and would gladly order a replacement bootie if one starts to wear through. So far, this is not necessary. I expect them to last us a couple of years since Remy doesn’t need to wear the boots very often. The only issue we’ve had with these boots is they don’t always stay on as well for off-leash running through snow. 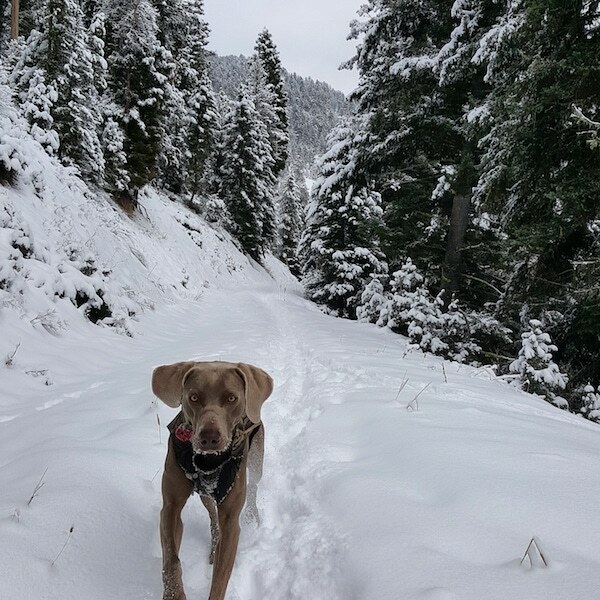 I tried letting Remy off leash a couple of times with his boots on, and one or both back boots would fly off in the deep and powdery snow. He runs like a madman through the snow! I think he might need a size smaller for his back paws, but if he’s running on a leash the boots always stay on. Usually, if it’s cold enough for boots, I keep him on a leash anyway for safety. I paid about $60 for a set of four medium boots. View them here. The price is slightly less if your dog wears a smaller size. 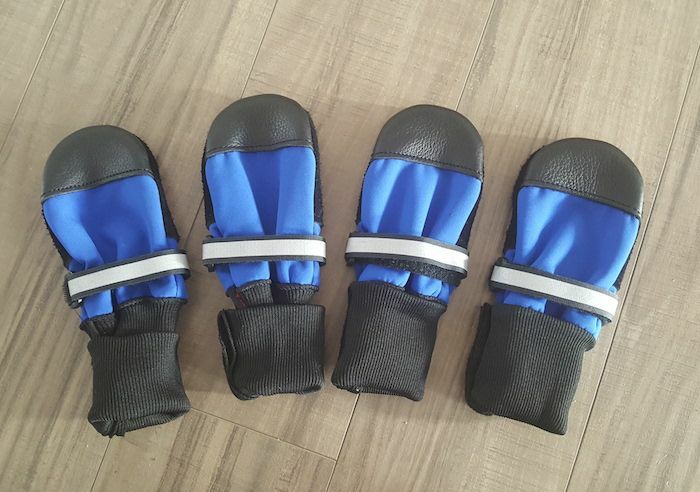 At first, I thought the price was a bit high for dog boots but now that I know they are good quality I think the price is worth it. You don’t want to buy a cheap pair of dog boots that will wear out right away. Measurements/sizing seems accurate – but you must measure! It’s challenging to measure your dog’s feet but you must do it! Snow can fall into the boot through the top “sleeve” if your dog has skinny legs. For this reason, Muttluks sells waterproof “mutt gators” for deep snow. Muttluks sizing options – What dog boots stay on the best? It’s nice that Muttluks makes many sizes ranging from “itty bitty” and XXS all the way up to XXL. 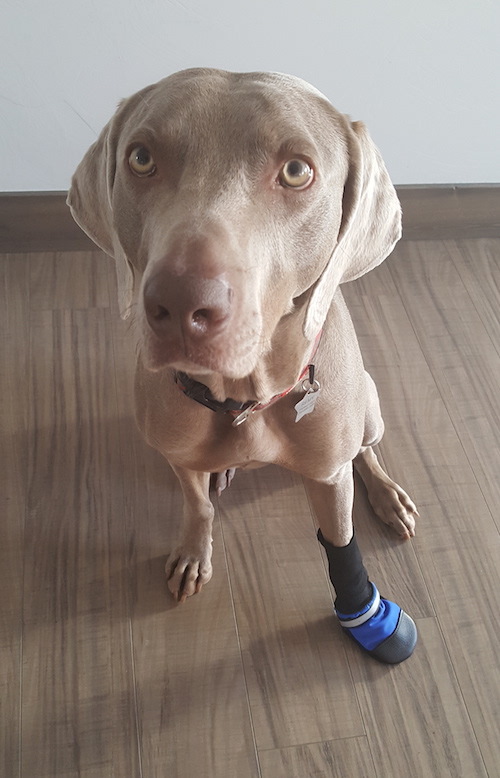 My 60-pound Weimaraner ended up with medium boots. His paws measured 3.75”, which is right in between the medium and the large. I’m very glad I went with the smaller size. When in doubt, go smaller. You want a snug fit. 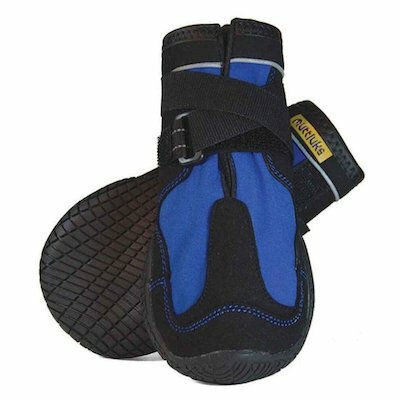 The “sleeves” of the boots are stretchy, and the Velcro straps allow you to strap the boots on TIGHT. You shouldn’t need to worry about hurting your dog with the Velcro. There seems to be plenty of “give” for circulation. I can’t stress enough how important it is to actually measure your dog’s feet. This can be challenging if you have an active or stubborn dog like I do. The company gives directions for measuring on their site, which I recommend you follow. Have your dog stand normally with a paw on a piece of paper. Draw a dot at the tip of the longest nail and at the back of your dog’s paw. Then measure the distance between the two dots. Make sure to measure a front and a back paw because they might be different sizes. I measured a few times to make sure I got it right. If your dog is between sizes or right on the edge, go with the smaller size because the boots need to fit tight. My 60-pound Weimaraner is right on the line between medium and large (3.75”), and I’m so glad I went with the medium. Even those seem a little big. The large would’ve been way too big! Do dogs really need boots? Your dog might also need boots to prevent snow and ice clinging to the fur between his toes. That can get really uncomfortable and tends to happen the longer you’re out. This is a more common problem for longer-haired dogs, however my short-haired dog gets balls of ice stuck around his nails. Boots can also protect your dog’s paws from de-icing chemicals. Do dogs like wearing boots? Of course not! Haha. Most dogs will not like wearing boots and most will not understand that the boots help to keep them warm. Still, a lot depends on your dog’s personality and tolerance. The reaction most dogs have to wearing boots for the first time is to either stand complete still like they’re standing in concrete. Or, they race around frantically like they’re trying to run right out of the boots! So much depends on your particular dog, but what I did with Remy was I slid one boot on a front paw in the house and gave him small treats as I was putting it on. After about 30 seconds I took the boot off and praised him some more. We did this a couple of times in the house over a few days. Eventually I put two boots on him. Then all four. We walked around the house for a bit and I always praised him and gave him treats as I put them on and took them off and while he walked around. Next, maybe the fifth time he had his boots on, we actually went out for a walk on a very cold day. After a few training sessions your dog will likely get used to the boots and you’ll get better at putting them on. They are tricky at first but not so bad once you’ve practiced a few times. My dog is pretty “feisty” and stubborn so I still use treats every time I put his boots on him. I think that’s an OK compromise. Sometimes I even give him a treat when I take the boots off to encourage him to sit calmly. But it’s much easier to pull the boots off than to put them on. My dog still really dislikes wearing his boots, even though he tolerates them. He would rather be a bit cold than wear them, so we only use them on extra cold days. I’d say, when it’s below 10 degrees or so if we plan to be out for more than 20 minutes. Some dogs can tolerate colder weather than that and some can’t. All depends on the dog, their coat type, how tough their paws are, etc. What about the All-Weather Muttluks? 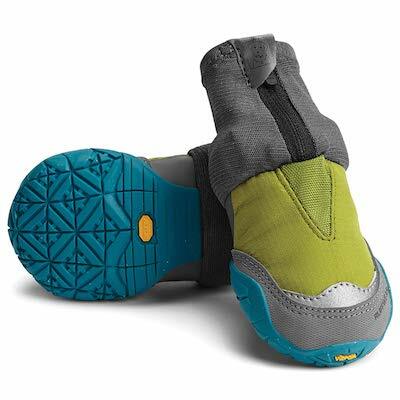 I haven’t tested out the all-weather boots, but the nylon exterior fabric is designed for paw protection on hot or cold surfaces such as hot sand or hot pavement in addition to ice and snow. View them here. What are the best winter dog boots? I have not tested other brands of dog boots or other models of Muttluks beyond the original fleeced lined dog boots featured throughout this post. So, feel free to leave your own recommendations in the comments section. If Remy and I test out additional dog boot brands, we will update this post and mention them here. Muttluks makes boots called “snow mushers” specifically designed for winter. I have not tested these but they are more rugged with rubber traction treads. They have an extra-large opening so they look easier to put on and have a double-wrap fastening system. I assume this also helps to keep some of the snow out. These sounds like great boots but I wanted to go with the lighter original Muttluks for my dog. I didn’t think he’d appreciate the more rugged boot, even though they would give him more traction. Note that the snow mushers come in 2 boots per package, not four. View them here. When I researched dog boots, I believed Muttluks were the best option for my dog. They looked durable but lightweight. 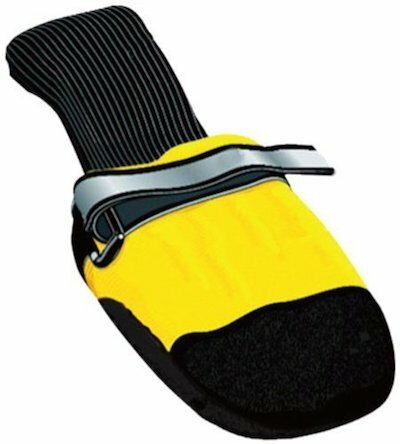 We also considered Ruffwear dog boots (view here) but have not given them a try. The looked a little heavier to me and they cost more, so we went with the Muttluks. View them here. The original fleece lined Muttluks featured throughout this post are not waterproof. They are water resistant and work great in the cold (when snow is not melting or slushy). 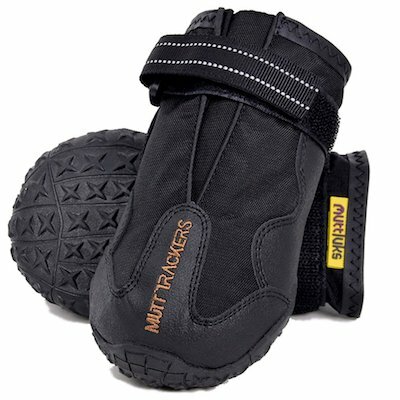 If you are looking for a waterproof boot, the Muttluks Mutt Trackers (below) are made with waterproof fabric. View them here. These boots are best for year-round hiking and running protection. I do not feel my dog needs boots in the summer but if your dog needs waterproof protection for hiking, this would be a good option. Note that the Mutt Trackers come in packages of 2 boots instead of four. View them here. Hopefully that helps you decide which type of dog boots are best for your dog! Giveaway! Win a set of dog boots for your dog! This giveaway has ended. Congrats to the winner, Jane K.! 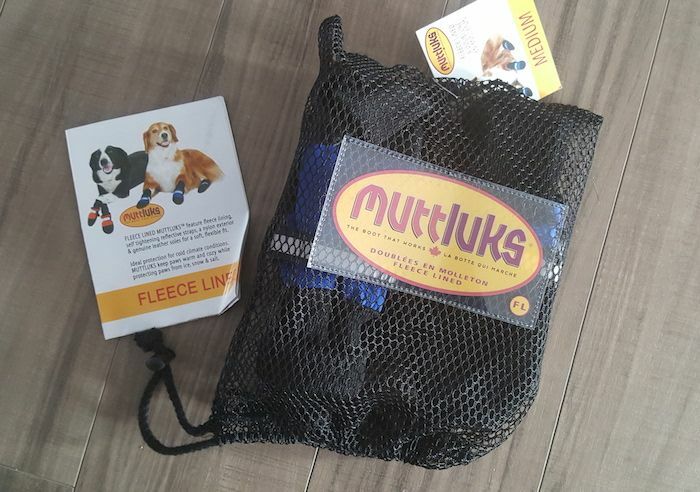 That Mutt is giving away a set of original fleece lined Muttluks to one lucky reader of That Mutt (includes 4 boots). This post is not sponsored. I will be ordering boots for the winner. I’ll draw a winner at random this week on Friday March 22. Must have a U.S. mailing address to win and the winner will be required to measure their pup’s paws so we get the best chance at the right size! 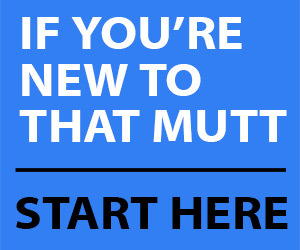 Would your dog benefit from some Muttluks dog boots? Please share this post with a dog lover who might be interested. That’s how I get new readers! These are the best dog boots on the market! I had a dog that dragged his foot and they even lasted through that. They were easy to put on, stayed on, and the dog didn’t mind wearing them! They were a little pricey but lasted better than anything else on the market and kept his feet safe!! I would highly recommend them! My dog could really use a pair of Muttluks because his little feet get really cold when he goes out in the snow. Yep. Little dogs don’t like to get their feet cold or wet! 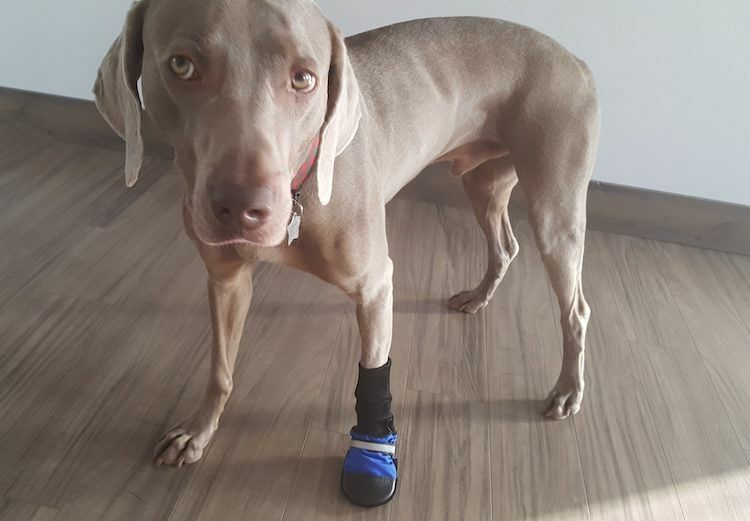 My dog Chance would benefit from the booties as he has issues with his feet & his feet are very sensitive & so this would be a great option for him in Winter. 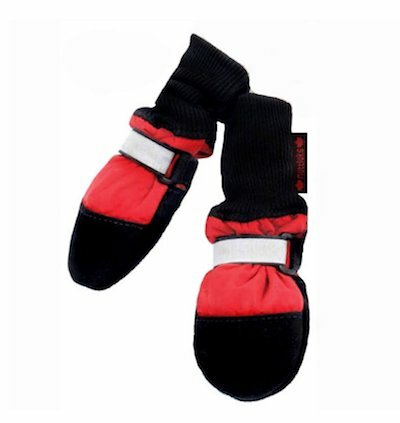 The most difficult thing about doggie boots is keeping them on during play or running in the snow. I haven’t had any luck at all so far. And in the summer when the asphalt is super hot, I’m afraid my pups paws will burn. I’m hoping the all weather boots would be perfect for both seasons. It sounds like the all weather muttluks are good for hot and cold weather, for the reasons you mentioned. Since Missouri has the extremes of hot and cold, it sounds like the all weather ones would be good for Posey. They’re so cute! Sasha could use these when it snows! Dogs feet are important too. We need to take care of them in heat, snow, chemicals, etc…I would like to find a pair of dog shoes that really work. Truly the best investment for dog owners! My pup knows what it means when I pull them out each winter!! I’m interested in the dog boots! Hoping my bulldogs feet will fit into them. My Dobie Jaxson isn’t a fan of cold or wet weather. He tip-toes and skirts each puddle. He’s sensitive or spoiled or both! I do worry about ice melt. My dog Stella recently suffered from an FCE and is currently having trouble with her 2 back legs and I believe these boots would help her when she is dragging her back paws. I’ve been thinking about boots for our 8 month old puppy Merle. He’s an English Pointer mix (rescue) and absolutely loves long walks around the reservoirs! We plan taking him to the metro parks and camping all summer with us hiking on trails and everywhere we can. He loves being outside and our winter was pretty cold at times and I’ve had to force him in the house when I could see him lifting his paws because of the cold. I would love to try a pair of Muttluks! If we had the chance to try these, I may be inclined to purchase a set of Mutt Trackers! By the way, I love reading all of your articles! Thank you! I would like to try a set of these on my viszla, Keeve. 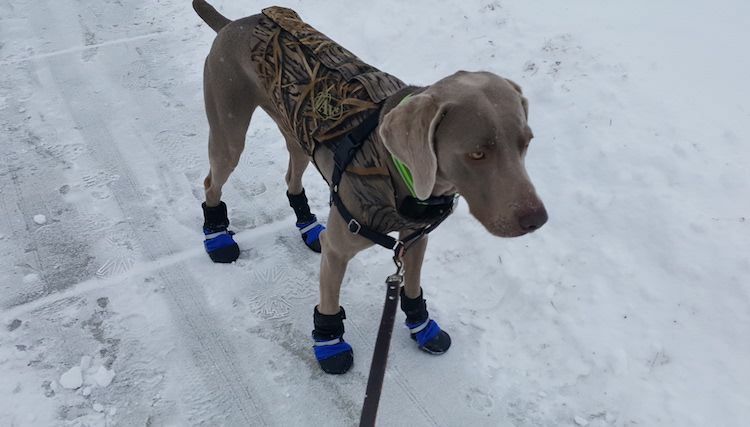 I haven’t tried dog boots on my Weim Bazley since he was a puppy. Really needed them this winter but wasn’t sure which ones to get. Would LOVE to try these!